Savannah was born in the quaint year of 1987; and has been a writer ever since. She currently lives in the magical town of Stratford Ontario, and loves nothing more than to sit by the river and watch the swans go by as she plots in her notebooks. 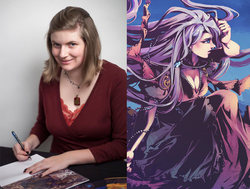 Savannah is known for being the lead writer and creator of the popular webcomic Amya. Amya is a high-fantasy series following the adventures of a mute spell-touched and her unlikely companions as they are pulled into an adventure that is greater than any of them could have anticipated; or ever expect to fulfill.